The next one to go. The news about Kaye Cowher’s death started circulating among my Pittsburgh friends Friday night. I might have missed it then, but I heard it loud and clear this morning — it was skin cancer that ended her life at age 54. I hate it because I’ve had skin cancer tumors removed already, on my arm, on my shoulder, and I’ve had a pre-cancerous lesion taken off my forehead. I hate it because I have two more spots on my arms that I need to be taken off as well. And, as I’ve said before, I hate it because it’s preventable. And because we — yes, including me, the one who’s had tumors removed and will likely have to do so for the rest of his life — still don’t take it seriously. Guys? Wear sunscreen. Put on a hat. If you can, stay out of the sun in the late morning and early afternoon. It’s really that easy. And. If you notice a spot on your skin that you haven’t noticed before. If you have a little sore that doesn’t want to heal. If a mole or a birthmark you’ve grown up with starts to change size or color. Please — the next time you see your doctor, point it out. Make sure your doc sees it. Ask if it’s something that a dermatologist should check. Because that little spot can kill you. 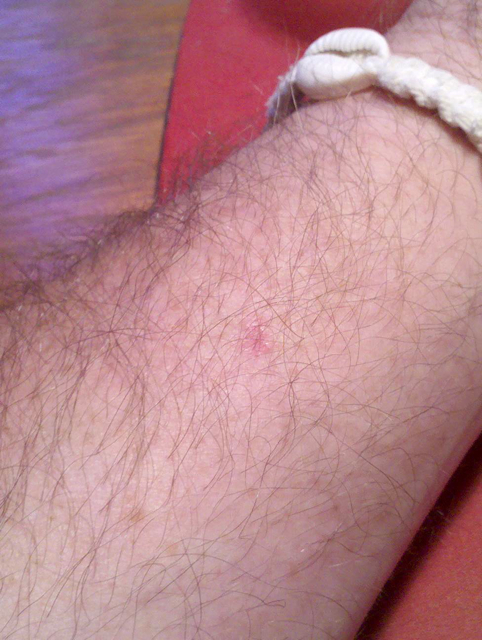 When I visited my dermatologist this morning, I was also told that the chunk of my arm she removed two weeks ago was in fact malignant; it was a basal cell growth, and she made the right call in removing it upon that initial appointment. This wasn’t a surprise to anyone. It’s why I went to see her, and it’s why she hacked it out immediately. She could also tell from the tissue samples that she removed the whole thing. So that one is done. We then turned our attention to my face, specifically to that dry patch next to my left eyebrow. She scraped a little sample, and then burned it off the surface. Even though they numbed the spot beforehand, this was every bit as disconcerting as was the digging from the first visit, only this time instead of the tugging and pulling, I got the smell of my own burning skin along with an unpleasant hissing noise. Those are minor inconveniences; again, I’m happy to be addressing these problems before they become Problems. The scraping she took will be biopsied, and what happens next depends on the results. She expects it to be malignant, but unless it turns out to be a more serious variety, I won’t go back until the fall so she can check to see if it’s all gone. If it is something more serious, I’ll visit in a couple weeks and we’ll take care of it then. Either way, I’m not too concerned — this time, I got someone to look at it early, when it’s easy to fix. You guys are all going to do the same, right? A few years back, I decided have a doctor look at a little sore on my shoulder, that one that didn’t want to heal. It had been there for nearly two years. It would dry up, and I think it was finally going away; then, out of nowhere, it would blister again. I had no idea what it was, but I wasn’t prepared to hear what my doc told me — I had skin cancer. When I went to see a dermatologist today, I knew what was coming. The dime-sized red blotch on my shoulder was behaving just like the first one did. I didn’t think she’d want to remove it right away, but she seemed to think we shouldn’t wait. So her assistant numbed my upper arm and while I anxiously stared at the wall on the opposite side of the room while she dug the growth out. When I write here, I often point out my intellectual shortcomings. I do it enough that there’s a whole tag devoted to the subject of me being an idiot. Much of the time, I’m joking. Today, I am not. Skin cancer isn’t hard to prevent. But when I was a kid, I just didn’t do what I needed to do to avoid it later. I shrugged off my mother when she reminded me to put on sunscreen. I didn’t think anything of working outside all afternoon with my shirt off. And when I got those blistering sunburns, I just thought it was a normal part of summer. It’s not. It’s easy to take care of. And I didn’t do it. I’ve been lucky. My first tumor was a squamous cell growth, one of the two most common — and not especially serious — kinds. My current doc believes that’s what this one is too. Squamous tumors — and the even more common basal cell carcinomas — don’t grow quickly and are easy to treat. That’s not to say this stuff should be taken lightly. If you’re diagnosed with melanoma, you have a serious problem, because that one moves quickly. That’s another way I’ve been lucky. 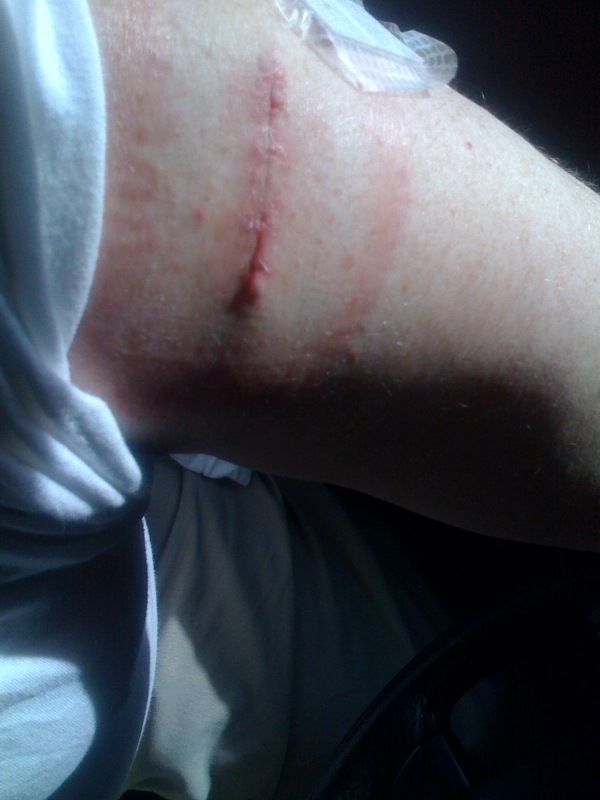 In both instances, I was a bit too nonchalant about getting these treated, and I won’t do that again. 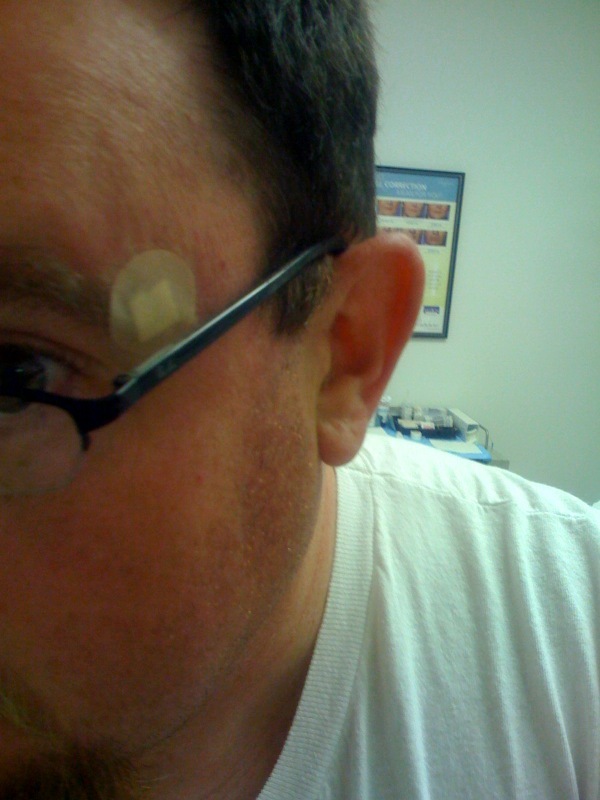 In fact, when I get these stitches removed in two weeks, I’ll also get a little dry patch on my forehead burned off as well. I’m not waiting to point these things out any more. Another thing I point out here frequently: most of my Pittsburgh friends are younger than I am. Guys? Before you dismiss this as more grumpy old guy talk from Uncle Crappy, here’s something to consider. That first growth showed up when I was about 33. It was removed when I was 35. I try really hard to avoid being too serious here, and I’ll stop with the preachy in just a second. However: wear sunscreen. Put on a hat. Stay out of the tanning bed. If you have a mole that changes size or color, if you discover a little patch of dry skin that doesn’t go away, if you have a sore that doesn’t want to heal, ask a doctor about it. It might only be a basal cell or squamous cell growth. It might not be anything. Or it might be something much worse. Don’t take that chance. I want to be friends with yinz guys for years to come.